These usually wait for the cold weather to come and then pass before they finally break open and bloom. 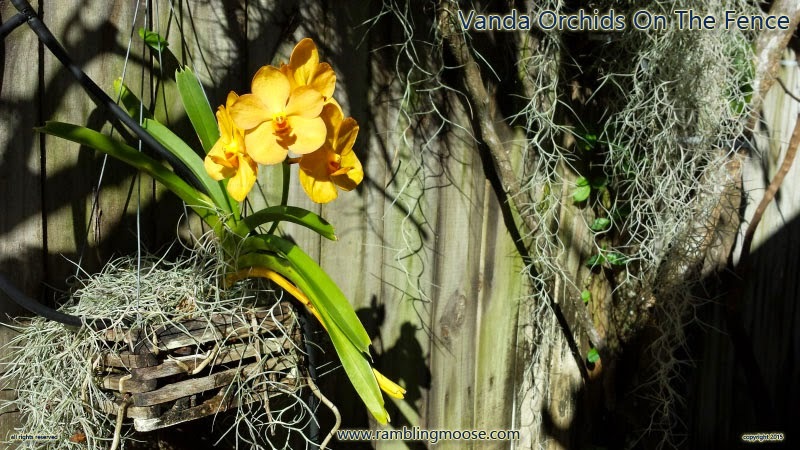 I've got two different pots of these vanda orchids, this one and a purple one that will bloom a little later. The plant has grown into the fence, so when we have that next tropical storm in season, it will have to be left there. I'm not brave enough to cut the roots off the wall since there are just too many. It's on my irrigation chain getting its half gallon of mist a day. When I repotted the thing, I made the point to use some live Spanish Moss to hold the bark in the wooden frame. The Spanish Moss likes the same "stuff" that the orchids do so I am either getting symbiosis or they're fighting. I'm not sure but since I have flowers I'm going to leave things as they go. They're a beautiful plant, and I like the flowers enough that the picture will end up on the wall or in the wallpapers folders for my machines. I remember being told that these things are so finicky and have to have just the right conditions to bloom. I must have them because the last time they were fertilized was about 4 years ago when I was able to pry them off the wall for a hurricane. I guess that the old wood on the wall is perfect for them which is perfect for me.